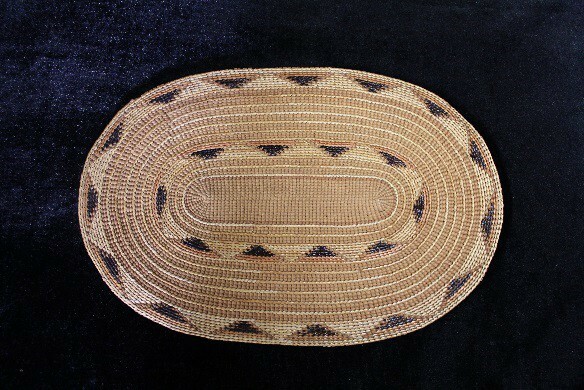 The Sheldon Jackson Museum’s September Artifact of the Month is a Tlingit, twined, spruce root oval mat (SJ-I-A-577B). It is decorated with an inner band and outer band of natural grass and maiden hair fern in false embroidery with the half head of the salmonberry pattern. The space between the bands is filled with concentric single rows of natural grass false embroidery. The edge of the mat is in the style of Frances Paul’s border #1. The mat is one of a set of four collected by Emily McCorkle Fitzgerald and one of fifteen pieces gathered by Emily McCorkle Fitzgerald, the wife of Dr. Jenkins (John) A. Fitzgerald. Other artifacts collected by McCorkle Fitzgerald and in the Sheldon Jackson Museum’s Collection includes a large spruce root ginger jar-shaped basket with a rattle lid cover, several doll hats made of spruce root, a mountain goat horn spoon handle with abalone inlay, a carved wooden dish in the form of a sea otter, a wooden rattle, a carved wooden salad spoon and fork set, and a doll. According to Lt. George Thornton Emmons, spruce root mats were small and have historically been made in two shapes. One shape was circular, similar to the bottom of a basket, and was called kuhke too-gu. This form of mat was made contemporaneously. The second form was called tarlth in Tlingit and was flat and oval and original used a dish from which dried food, such as dried berries or roots was eaten or upon which guests at feasts would place their horn spoons. The Sheldon Jackson Museum is home to thirteen spruce root mats and over three hundred spruce root baskets. The September Artifact of the Month will be on exhibit until September 30th. Visitors may see these artifacts and other examples of spruce root basketry in the collection at the museum during operating hours - Tuesday through Saturday between 9am and 4:30pm. General admission is $7, $6 for seniors, and free for those 18 and under or members of either the Friends of the Sheldon Jackson Museum or Friends of the Alaska State Museum. 1 The collection of original letters pertaining to Sitka are in the collection of the Sitka Historical Society.